As you may know, dirty diapers can stink! Good cloth diaper pails will help to prevent odor until laundry day. 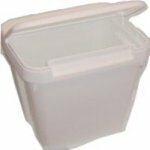 There are a couple of basic ways to store your dirty diapers - a dry diaper pail or a wet pail. I will give you the low down on these different methods of cloth diaper pails so you can decide which will work best for your situation. A dry pail is just as it sounds - a pail to store your dirty diapers in. You can use whatever type of pail you choose. I use a lidded 54 quart garbage can from Wal Mart. It was super cheap and does the job nicely. I have found a few diaper pails made just for cloth diapers though. Some of them have locking lids, and some have handles to carry it to the laundry room. Very nice features. One of my favorite features about these pails is that they are built with either a slot for a deodorizer, or carbon filter. These helps ensure that the odors stay in the pail and out of your nursery. If you use a dry pail a pail liner is a great convenience. It fits in just like a garbage bag would, and you can take the pail out to carry to the laundry room instead of the whole pail. What I like about pail liners is that they keep your cloth diaper pail clean and you just throw them in the wash with your diapers. A diaper pail is made with PUL or PVC and has either elastic or a drawstring around the opening. Pail liners are made to be large enough to fit in any diaper pail or 13 gallon garbage can. It is not necessary to use a lid on your cloth diaper pail. As a matter of fact many moms choose not to use a lid because they feel it actually helps cut down odors by letting them breathe. As the mom of a very curious toddler, I don't choose to go this route. I keep my pail in my son's room though. If you were to keep the pail in a place out of reach of little hands you can probably get away with no lid. I suggest keeping your cloth diaper pail in a cool area. If your pail gets hot - say you have it near a window or area of the house that gets hot during the summer - the diaper will start to smell worse. Trust me it's not something you want to smell. If you do have any odor problems you can sprinkle baker soda into your pail, or a deodorizing powder. Rockin Green makes some great pail powder, and yes it really does work! You may also use a hanging wet bag in place of a pail. A hanging wet bag is generally a bag made with an inner layer of PUL, an outer layer of knit print and a handle. They often have zippers, so you can help contain odors. Hanging wet bags are not as big as a diaper pail and won't hold as much. If you plan to wash every day, or don't have many diapers, a hanging wet bag might be a perfect solution. The wet pail is a lidded pail filled with water. The purpose of using a wet pail is to pre-soak the diapers before washing to help eliminate stains. It also makes the laundering process a little easier. You can cut out your pre-rinse because you have already been soaking your diapers. Setting up a wet pail is simple. You need to have a pail with a lid - a locking lid is preferred. This way you can keep little ones out. Not only would it be unsanitary for your child to get into a wet pail, it can also be a drowning hazard. Fill your pail 1/4 full of cold water - you can add a dash of baking soda or vinegar to help minimize odors if you choose. Before you throw any dirty diapers into your wet pail, make sure to shake off any solid matter into the toilet or clean off with a diaper sprayer . Unfold diapers before placing them into the pail. Change the water in the wet pail every day to eliminate odors and wash the diapers no less than every 3 days to prevent mold from growing on them. Once you are ready to wash dump all the contents of the wet pail into the washer. Run a spin cycle to get any excess water from the diapers, then do your normal hot wash/cold rinse. Another spin on the wet pail is using your washer. After you rinse of your soiled diapers, you throw them into the washer to soak. If you happen to have an extra washer just for diapers, or you don't need to do laundry daily, this might work great. Just leave them to soak for the day, then do a quick rinse or you can do a mini load every night. There are a few disadvantages to having a wet pail. A pail filled with water and soaking wet diapers will be very heavy. This will make it difficult to move it when its time to change the water or launder the diapers. It can be a real pain to have to change the water and if any spills, well I think you can imagine how gross that would be. If you like the idea of having your diapers pre-soak, but don't like the idea of the wet pail, a combination of a wet/dry pail might be the answer. A wet pail/dry pail is the best of both worlds. Instead of having an actual pail full of water, you rinse your diapers off after changing your baby. This means all diapers - poop, pee, exclusively breast or bottle fed included. Then you throw them into the dry pail. This way your diapers are still getting the benefit of getting rinsed and basically a mini soak because you are throwing them into the pail soaking wet. Then just wash with your normal laundering routine. You may find it helpful to keep your cloth diaper pail in the bathroom if you use this method. Then you can rinse off the diapers and throw them right into the pail without much of a mess. I think this is a great method myself, and it can really help cut back on stains and odor. Whichever method you decide to use to store your dirty diapers is definitely a matter of preference. One cloth diaper pail is not better than the other because they both have their pros and cons. As long as you find a solution that doesn't stink up the room and makes it easy on you, then that's really all that matters.